Granville R. Williams, Gunners Mate 2/c, born Aug. 4, 1919, Big Spring, TX. 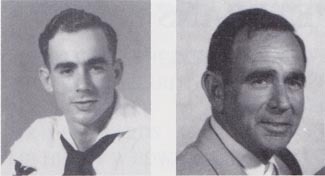 He joined the USN Dec. 11, 1939; trained in San Diego, CA; and was then assigned aboard the USS West Virginia. He operated in and out of Pearl Harbor from 1939-41.
torpedo planes (Japanese) headed for battleship row. They were hit six times, then a 500 lb. bomb hit mid-ship. A large explosion blew them into the water and oil. His shoulder and leg were broken and he was rescued. The Japanese strafed them in the water. After release from the hospital he was assigned to the USS Enterprise, then reassigned to the West Virginia when she was being raised and came back to Bremerton, WA. They encountered a Japanese sub en route. After renovations, he went on shakedown cruise out of Long Beach, then reassigned to Long Beach Naval Hospital and received a medical discharged. Discharged Nov. 14, 1944, as gunners mate 2/c. He received the Purple Heart. Married and has four children and six grandchildren. He enjoys camping, fishing, reading and being a spectator of football.